And the Oscar hits continue. Have not thought about this movie for a long time but remember it as truly remarkable. A Beautiful Mind is a 2001 American biographical drama film based on the life of John Nash, a Nobel Laureate in Economics. The film was directed by Ron Howard and written by Akiva Goldsman. It was inspired by a bestselling, Pulitzer Prize-nominated 1998 book of the same name by Sylvia Nasar. 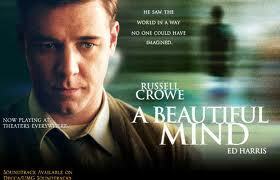 The film stars Russell Crowe, along with Ed Harris, Jennifer Connelly, Paul Bettany and Christopher Plummer. The story begins in the early years of a young prodigy named John Nash. Early in the film, Nash begins developing paranoid schizophrenia and endures delusional episodes while painfully watching the loss and burden his condition brings on his wife and friends. The film went on to win four Academy Awards, including Best Picture, Best Director, Best Adapted Screenplay, and Best Actress in a Supporting Role. It was also nominated for Best Actor in a Leading Role, Best Film Editing, Best Makeup, and Best Original Score.Even though it was well-received by critics, the film was criticized for its inaccurate portrayal of some aspects of Nash’s life. The film was shot 90% chronologically. Three separate trips were made to the Princeton University campus. During filming, Howard decided that Nash’s delusions should always first be introduced audibly and then visually. This not only provides a visual clue, but establishes the delusions from Nash’s point of view. The real John Nash’s delusions were also only auditory. A technique was also developed to visualize Nash’s epiphanies. After speaking to a number of mathematicians who described it as “the smoke clearing”, “flashes of light” and “everything coming together”, the filmmakers decided upon a flash of light appearing over an object or person to signify Nash’s creativity at work. Two night shots were done at Fairleigh Dickinson University‘s campus in Florham Park, NJ, in the Vanderbilt Mansion ballroom. 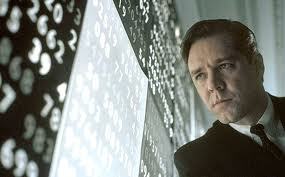 Many actors were considered for the role of John Nash, including Bruce Willis, Kevin Costner, John Travolta, Tom Cruise, John Cusack, Charlie Sheen, Robert Downey, Jr., Nicolas Cage, Johnny Depp, Ralph Fiennes, Jared Leto, Brad Pitt, Alec Baldwin, Mel Gibson, Sean Penn, Guy Pearce, Matthew Broderick, Gary Oldman and Keanu Reeves. A couple of quotes for you to remember. Charles: So what’s your story? You the poor kid that never got to go to Exeter or Andover? Nash: Despite my privileged upbringing, I’m actually quite well-balanced. I have a chip on both shoulders. Nash: Terrified… mortified… petrified… stupefied… by you. I believe it it time to watch this one again. Hope you agree. Thanks again to Wikipedia and IMDb for making this possible. Next postSock it to me!